Here's a minor update to tide you over until the big 1.1.0 update! The cloud saves are finally in! 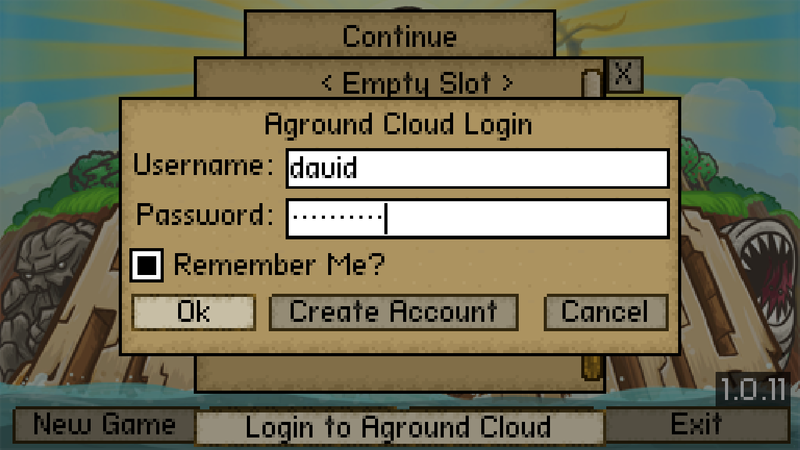 Cloud Saves - Login to Aground Cloud and all your saves and settings will be automatically synced across browsers, websites, and even with the exe version of the game. No more losing saves because of clearing your browser history! Developer Console - This is mainly for developers and modders to view details and run scripts in game, but it also comes with a built in debugger that will show an error should the game crash and allow you to send that error directly to me for faster debugging. Can be opened with Ctrl+Shift+D, and special commands are: clear (clears the console), watch variable (shows that variable wherever you are), unwatch variable removes from watch list, and debug [hide] to display debug info and watch variables. Added chinese fan translation - this required some improved font support in game. Fullscreen HTML5 - You can now go fullscreen in the HTML5 version (depending on the browser)! Other minor adjustments and bugfixes (including the dragon fight crash). In other news, we're preparing for our Kickstarter, which you can read about (and other plans) here: https://www.reddit.com/r/aground/comments/7qmbry/aground_kickstarter_plans/ . This will probably be the last update until we launch the Kickstarter on January 31st - which will include at least one of the next islands! The Create Account page let me create an username with `_` (underscore), but I'm unable to type this character in the text input from the game. Is this intended? Or a bug? Also, I have not activated the account (from the link in email) because of this. Should I let it expire? (Does it expire? In how much time?) Or can I confirm and be able to change my username afterwards? I just tried typing an _ in both the windows and html5 version, and it works fine. It won't let you login until you activate the account though (it will say bad username and password). The accounts never expire, but I can delete it if you want to change your username. Signed up to Aground Cloud in the Kongregate version however after verifying email it is giving me the error "bad username and password". I checked the downloadable version and I was able to log in. Make sure the password is correct. Also, some people were having trouble getting the text input to do special characters (but they work for me - try it in the username box to see if it works). No special characters used in the name or password and the same username and password work in the desktop version. I can type special characters in the username box, however, the keyboard layout appears to be enUS and not enGB like my computer. I've tried the web version of the game on the multiple sites it's hosted in Chrome, Firefox and Edge both in normal and private/incognito modes and they all give the "bad username and password" error. Strange, I usually use the number pad to enter numbers so I tried it using the numbers above below F keys and it seems to have worked with no problem in multiple browsers. Weird, I used the numpad in the username field, and it wrote characters a-i instead of 1-9. Probably because it's not a real text field like the exe one, I just use the keyboard event's charcode value, which is incorrect.